The latest high-profile incident involving a drone — the January 26 discovery of a crashed quadcopter on the White House lawn — highlights how far events have gotten ahead of regulatory plans and policy for unmanned aerial systems (UAS). According to news reports, the operator of the drone Shawn Usman, an employee of the National Geospatial-Intelligence Agency (NGA), which provides imagery and analysis for U.S. military and civilian intelligence agencies. Usman in currently under investigation by the U.S. Secret Service for possible criminal charges, and the Federal Aviation Administration (FAA), for civil charges. The aircraft in question, a Phantom 2 unmanned aerial vehicle (UAV), is manufactured by DJI Technology Inc., a privately owned and operated company founded in 2006 and headquartered in Shenzhen, China. Its guidance and navigation apparently depends on a u-blox GPS/compass module. DJI’s Phantom UAVs measure about two feet by two feet and weigh about 2.2 pounds. Had the incident not occurred in the nation’s capital, Usman arguably might not be subject to the FAA UAS regulations Phantom because its weight and size could place it in a model aircraft category not subject to the UAS rules. However, following the 9/11 terrorist attacks in this country the agency banned unlicensed UAV flights within 15.5 miles of Washington, D.C. A NBC news report said that area policy agencies have investigated 20 incidents of UAV flights in recent months. According to the New York Times, Secret Service sources said that Usman told them he had been flying the Phantom, which he had borrowed from a friend, inside his apartment early in the morning. 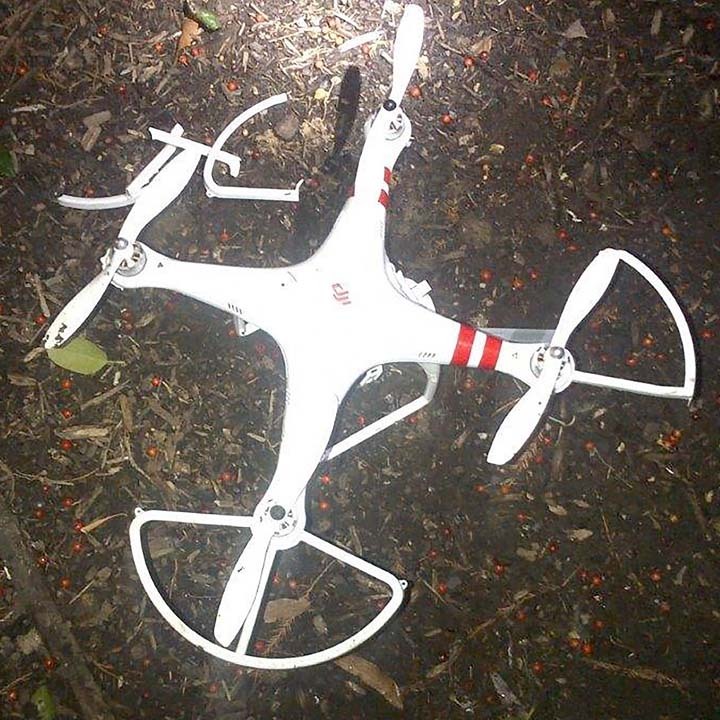 When he began guiding it outside an apartment window, the UAV reportedly lost its connection with the controls, set off on an “auto-return” flight to preprogrammed coordinates, and crashed on the White House lawn when it ran out of battery power. The Phantom’s lithium/polymer battery supports flight times of about 25 minutes between charges, according to DJI. The controls operate in the 2.4 GHz industrial, scientific, and medical (ISM) RF band, which generally doesn’t require a license. In open areas, the Phantom’s communications link has a range of about 1,000 meters but may have been blocked by the exterior wall of the apartment building. Recreational use of airspace by model aircraft is covered by FAA Advisory Circular 91-57, which generally limits operations for hobby and recreation to below 400 feet, away from airports and air traffic, and within sight of the operator. They may not be used for commercial purposes. In November 2013, the FAA unveiled "Integration of Civil Unmanned Aircraft Systems (UAS) in the National Airspace System (NAS) Roadmap," a 74-page document that lays out the tasks needed to successfully weave the operations of thousands of commercial drones into the airways without putting at risk the more than 15 million passengers who traverse U.S. skies daily. The U.S. Department of Transportation (DoT) also released a companion publication, Unmanned Aircraft Systems (UAS) Comprehensive Plan, which covers the responsibilities of five other agencies including the Department of Defense (DoD), Department of Homeland Security (DHS), and NASA.